System designed to improve the quality of water by reverse osmosis, one of the most advanced methods of water purification. Removes 90-98% of all water pollution: mechanical, compounds dissolved and micro-organisms. Sediment filter 20 mic - removes pollution type: sand, mud, sludge, dust, rust size greater than 20 mic. Activated carbon filter - removes chlorine and many organic and inorganic compounds. Sediment filter 5 mic - removes pollution type: mud, sludge, dust, rust size greater than 5 mic. Reverse osmosis membrane - the most important part of the system-removes: bacteria, viruses, heavy metals, radioactive elements and many other compounds dissolved in water. 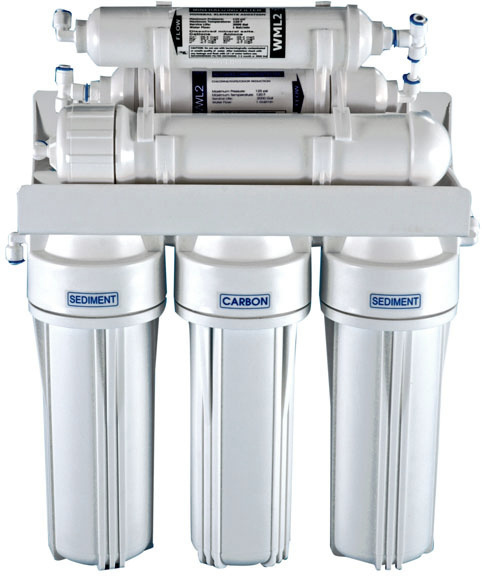 Post-carbon filter – improves the taste, color and smell of water stored in the reservoir. Mineralization filter - add minerals to purified water necessary for human organism such as: magnesium, calcium, potassium and sodium. System contains all the accessories you need to install and use a filter such as: a set of cartridges, reverse osmosis membrane, faucet for the purified water, storage tank and assembling kit.